Balloon is a multi-player minigame in WarioWare: Smooth Moves. Each player plays as a Mii. 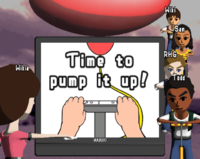 The game plays very similar to Balloon Bang in WarioWare, Inc.: Mega Party Game$!, in which one player plays microgames whilst the opponents are inflating a balloon. The player plays microgames until they win one, at that point they swap with the next player who must then do the same. The player who is playing the microgames when the balloon explodes is the loser. This page was last edited on September 2, 2018, at 21:55.